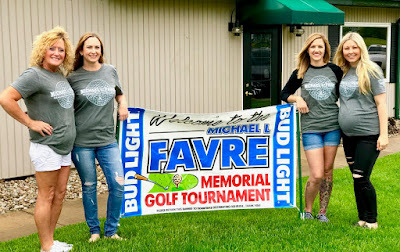 $13,000+!...That's how much money was raised for Fight the Fight through the charitable efforts of everyone involved with the planning and organizing of the 4th Annual Michael L. Favre Memorial Golf Tournament. The event has been a smashing success as a fundraiser for FTF raising over $49,000 in total donations. We are still in the process of giving all the money, from past tournaments and this one, away to our donation recipients and will be for years to come. 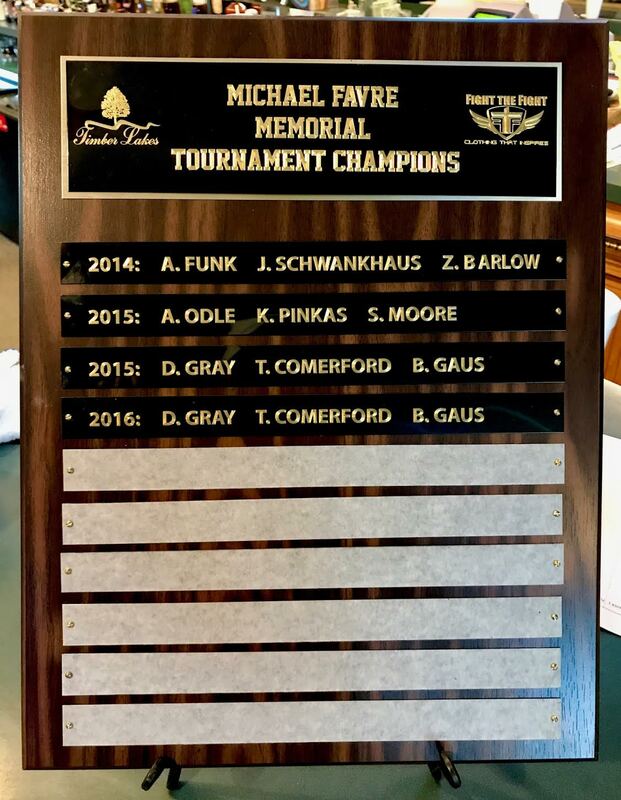 On the surprisingly wet and cold Saturday morning in late May over 140 players participated in the 18 hole, 3 man scramble format tournament. And despite the less than ideal weather, everyone involved had a great time. The immaculately groomed course at Timber Lakes in Mt. Olive, IL was set up nicely for the large volume of high level competitors that entered the tournament. Players come from all over central Illinois to play in the tournament. As I drove around the course to snap a few pictures and videos of the players in action, every group was laughing and having fun when I pulled up. Some of the guys I watched tee off hit the ball so far and so straight that I couldn't see it land. For any extreme novice golfers out there, like me, shots like this seem seem like nothing short of David Copperfield magic tricks. When it was all said and done, this year's champions were Andy Odle, Brandon Holtz, and Scott Moore. 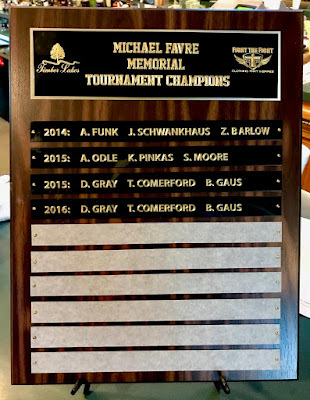 The winning team was awarded a large cash prize and gets their names forever engraved on the champions plaque that hangs in the Timber Lakes Golf Course Club House! Joseph F. Boente Sons Inc.
Every year this event is a privilege and a joy for FTF to be a part of. It is truly a win-win-win for everyone. It's a great event benefiting a great cause in memory of a great man!